KIEV, Ukraine -- The speaker of Ukraine’s Parliament huddled under umbrellas as eggs rained down and smoke bombs filled the chamber with an acrid cloud. Parliament speaker Volodymyr Lytvyn was pelted with eggs and had to preside behind a shield of umbrellas. Then the lawmakers attacked each other, punching and brawling in the aisles. The chaos erupted Tuesday as Parliament narrowly approved a 25-year extension to Russia’s lease on a naval base in a Ukrainian port on the Black Sea until 2042 — a move bitterly opposed by pro-Western lawmakers. Ukraine would get cheap natural gas from Russia in exchange. Ukrainian politics are contentious, and the Parliament is often rowdy. Even so, Tuesday’s session was exceptional, offering a glimpse of the raw emotions surrounding the country’s divisive relations with Russia. Ukraine, about evenly divided between its Europe-leaning west and its Russian-leaning east, has in recent years become a flashpoint in the struggle between the Western world and Russia for influence in the countries of the former Soviet Union. And for many Ukrainians, the naval base has been a symbol, for better or worse, of the Russian role in the country. Russia’s influence in Ukraine has surged since the February election victory of pro-Kremlin President Viktor Yanukovych. The win infuriated Ukrainians who resent Moscow and inflamed the violent passions that plague the politics of the former Soviet republic. The current base lease expires in 2017, and the base’s opponents said Russia should withdraw after that. Moscow has based its Black Sea Fleet there since czarist times. Yanukovych said the reduction in gas prices would bolster Ukraine’s sagging economy and help it meet its obligations to the International Monetary Fund. The opposition was not swayed. “Ukraine has begun to lose its independence,” said Yulia Tymoshenko, a former prime minister who lost the presidential race to Yanukovych. 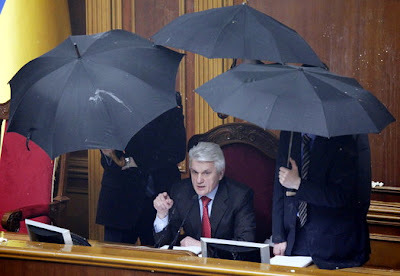 As Parliament speaker Volodymyr Lytvyn opened Tuesday’s legislative session, opposition members threw eggs at him, forcing him to preside behind black umbrellas held by aides. About 7 minutes into the session, a smoke bomb went off underneath the draped flag and another was hurled from the back of the gallery. The chamber filled with an acrid cloud as smoke alarms went off — unprecedented scenes in the Parliament. The lawmakers’ bickering deteriorated into members throwing punches and grappling during the nationally televised session.